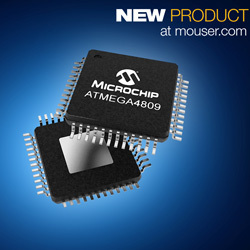 Mouser now offers the ATmega4809 8-bit microcontroller from Microchip Technology. The MCU introduces a new series of megaAVR microcontrollers created to provide highly responsive command and control applications. The microcontroller features CIPs, allowing it to execute tasks in hardware instead of through software, while an integrated high-speed ADC with voltage reference allows faster conversion of analog signals. Because of the advantages provided by the hardware-based CIPs, the microcontroller was chosen to be the on-board microcontroller for the Arduino Uno Wi-Fi Rev 2 board. The microcontroller is based on a high-performance 8-bit AVR RISC CPU. The device’s flexible, low-power architecture provides three sleep modes, enabling developers to select the ideal balance between processing speed and power consumption. The device’s CIPs include CCL, CRC, and five 16-bit timers, resulting in reduced frequency of delayed responses and an enhanced user experience. Robust and responsive, the microcontroller provides an operating range of 1.8V to 5.5V and an operating temperature range of -40C to 125C. With the support of factory-calibrated oscillators, the device is able to give stable performance up to 20MHz under extreme temperature conditions. Also available is the ATmega4809 Xplained Pro Evaluation Kit. Supported by the Atmel Studio integrated development platform, the evaluation kit offers a demonstration and development platform for the microcontroller and enables developers to understand how to integrate the microcontroller into a custom design.